Ar. ’anbar, ‘abir, Fr. amber gris, MEng. amber of grece, ambergrease, ambregris, ambergris, amber-greece, Eng. ambergris, a fragrant grayish waxy substance that is the intestinal secretions that the sperm whale excretes in their feces and by regurgitation. Usually, it is found floating on the surface of the ocean, sometimes in masses from 60 to 225 lbs. On the Portuguese Atlantic coast, it is abundant. 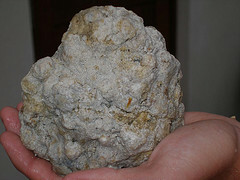 Muslims there imported ambergris from the Algarve and Madagascar. It was highly valued for its fragrance once aged as it was used in expensive perfumes around the Mediterranean. In Al-Andalus, it was used frequently not only in perfumery but in Aphrodisiac products as well. It was added as flavoring to sweets and beverages in the Middle East. The English added it to sweat dishes such as “Paste-Royal,” custards and pancakes along with musk (see almirze). It is said that Charles II of England ate it in his eggs for breakfast. During the Middle Ages it was added to ragouts and jams as well. Hispano Arabs used it in incense burners as the fragrance lasted a long time. Al-Andalus poets lauded ambergris to the extent that it became the synonym for perfume. Abu Yahya Mu’izz ad-Daula al-Mu’tasim billah (g. 1052-1091), sovereign of Almeria, sent the following message to one of his wives by carrier pigeon: “This pigeon will transmit, as proof of my affections, fragrant, perfumed messages with sweet-smelling odor of ‘abir (ambergris).” In 1362, during a reception offered by Muhammad V, the Nazrid Sultan, to inaugurate various new rooms in the Alhambra palace an uprising almost occurred during the responses in unison of the dikr (remembrance of Allah) when they turned into a competition between the elite and the commoners. The incident was quailed by filling the hall with the smoke of “magic” ambergris and then showering the guests with rosewater. The awe was so great that the guests were silenced and the ceremonies resumed. These 'sausages' browning on a seventeenth century gridiron, are in fact two different sweet puddings from the reigns of James I and his son Charles I. The large ring on the left is a Rice Pudding, made from a recipe in Gervase Markham's The English Huswife (London: 1615). The three smaller ones on the right are Lord Conway's Ambergris Puddings from The Queen's Closet Newly Opened (London: 1655). Both recipes are given below. Thoroughly wash intestines and hang out to dry. Chop the almonds. Then grind half them into powder. Mix all the almonds with the lard. Add sugar. Grate the bread over this mixture. Add ambergris. Bruise musk in a marble mortar with orange blossom water and mix well. Fill the intestines with the mixture. Tie intestines shut and prick holes in them. As this is a 17th C recipe the pudding is grilled. During the Middle Ages it would have been boiled. This recipe was given as a great rarity to Lord Conway at a reception in his honor by an Italian. The lord in turn gave the recipe to the queen’s ladies of honor. Por fin veo el famoso ámbar gris! Lo que no me podía imaginar es que hicieran con él salchichas DULCES! Una idea 100% inglesa. Me pregunto si lo seguirán haciendo. This is really fun! Thanks for sharing. Many thanks for your comment. It is wonderful know one has appreciative readers! 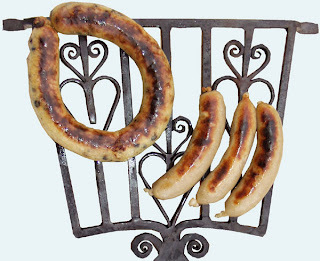 Yes, only the Brits would have sweet sausages. Due to whaling restrictions ambergris is very hard to obtain and is most expensive. In perfumery it is labdanum or chemical fixatives are used as substitutes. Labdanum could be used as a substitute in culinary dishes. Charles II of England's favorite breakfast item was scrambled eggs with ambergris! The University of British Columbia has identified a gene in balsam fir trees, which can be used as an economical substitute for ambergris. In the Mediterranean, sage has been cultivated as a substitute.